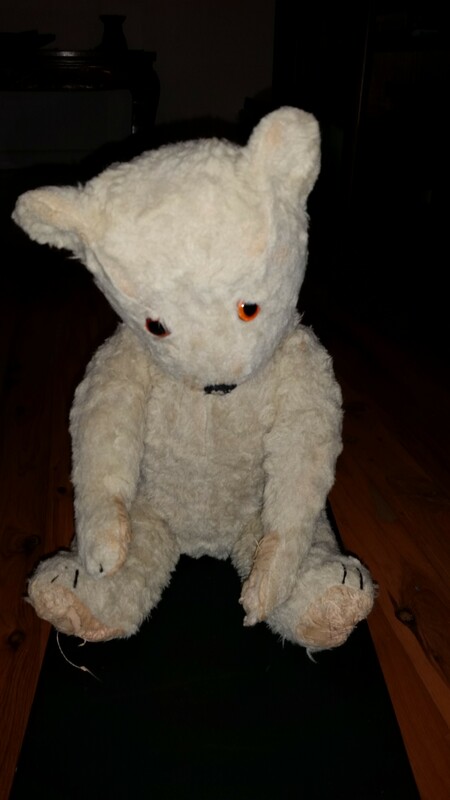 Collecting Vintage Teddies-How Old Is Teddy? It’s not hard when you collect teddies to” buy what you like”. With so many endearing faces peering at you from sellers, it can be harder to NOT buy what you like! When buying vintage or antique teddies it is important to learn the identifying features that help to date them. Whether forÂ the fun of knowing when teddy was made or for making informed investment decisions, learning about teddy adds to the experience of collecting. Often, bears can be attributed to their maker simply by style or look. Many manufacturers have distinctive features in the bears that make them readily identifiable. A label is the most definitive means of telling who made Teddy though. The maker helps to determine the value; some are considered premium and highly sought after, such as Steiff, Chiltern, Joy Toys or Ideal. Mohair was used originally. Very soft and silky, it is a fabric woven from angora goat fleece.Â Artificial silk plush was used from the 1920s, in various colours, with nylon plush invented in 1938. Sheepskin was popular in the 1930s and 40s. Mohair or mohair/synthetic plush continued to be most popular until the 1950s when acrylic plush was increasingly used. Synthetic plushes were further developed in the 60s, with the machine washable bear promoted for children! Felt was used for the pads of theÂ earliest bears. Later, after WW1, cotton was popular (as cotton, brushed or velveteen). Rexine was used by some British and Australian manufacturers, which was a coated oil cloth. By the 1960s, synthetic fabrics were increasingly used. The earliest bears were stuffed with woodwool (excelsior), made from long, fine wood shavings. This gave the teddy a crunchy feel if squeezed. Later, after 1914, kapok (a silky fibre from the seed pod of a tropical tree, similar to silky cotton wool)Â came into use. Teddies stuffed with kapok feel firmer and heavier, and resist insect attack. WW2 meant kapok was no longer available for toy use, as it was used to line life jackets for soldiers, and so “substitute” (sub) became popular, being the waste from textile mills. Cork granules or rubberÂ were also occasionally used, which tended to break down over time, giving ted a strange sensation of movement within! By the 1960s, plastic foam (a shredded, sponge-like foam) was most popular, as it allowed for teddies to be wholly synthetic and machine washable. Polyester wadding was used from the 1970s until the present time. There are a multitude of shapes and styles, however the shape ofÂ the teddy bear has changed from its inception, and can help to date when it was made. The very earliest bears had a comparitively pointed snout and longer limbs. Shorter, stumpy limbs were popular in the 1950s. The unjointed, splayed-arms bear was typically 1960s or 70s, by several firms. Early bears were jointed with cardboard or metal discs, attached with metal pins, which can sometimes show as rust through the fabric. Plastic joints were first used in the 1960s. Originally, from 1902-1915, teddy bear eyes were wooden or leather-covered wooden boot buttons, on wire hooks or shanks. Glass eyes replaced these from WW1, in various forms-amber or blue, and black, or clear with painted backs. Glass eyes are cooler and harder than plastic eyes-putting your lips on them to feel how cool, and tapping your teeth on the eyes can give a good indication! Also,Â glass eyes are rounder, if you feel behind them with your fingers. From 1955, plastic screw-in eyes were being used by most makers, as a safety precaution for children. Law requires thatÂ manufacturers use these, unless theÂ teddy is labelled as not being a toy. Generally, noses were originally hand-stiched with black or brown thread. Many makers had their own distinctive shape. Some also chose to use curled leather, painted composition or gutta-percha (a natural form of plastic). From 1945, moulded plastic first came into use. Some teddies were also made with a painted tin or moulded rubber noses. After 1970, plastic safety noses are most often used as toy teddies for children. 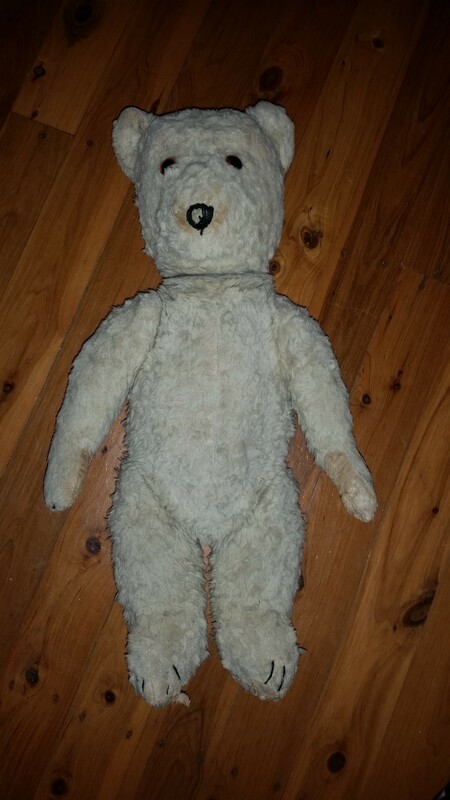 Just wondering if you could give me an idea of the value of this old teddy we came across in an abandoned storage unit. Any info you could provide would be great, we might be interested in selling on your site if possible too. Let me know if you need more info than the pic. 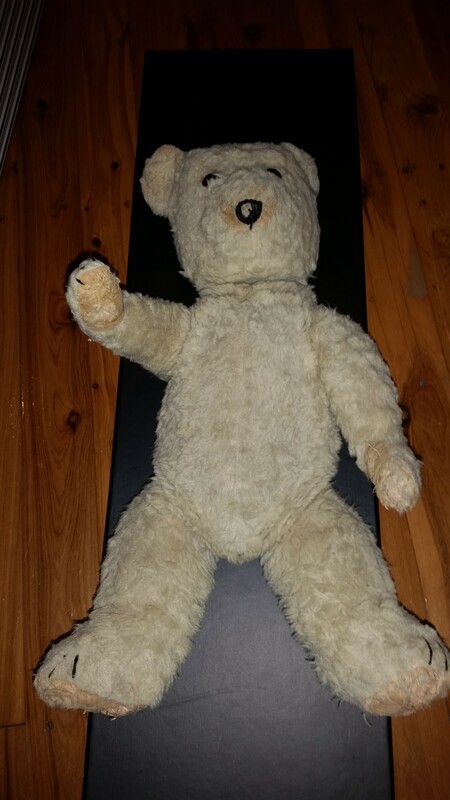 he is in quite good condition considering the age, jointed legs and is 48cm tall. Thanks for your picture of teddy. If I ask some questions, that will help to identify him. Is he stuffed with a cotton wool-like stuffing, or with wood shavings? He appears shiny. Would you say his fur fabric is an artificial plush? Are his pads made of cotton, or felt? Does he have any bits of a tag left? At the moment I feel he is English, from the 1940s, perhaps a Chiltern bear, but I’ll wait to hear more about him. He feels like he is stuffed with cotton wool. Fur is a synthetic plush (though not shiny, thats just the pic) the pads seem to be a woven fabric, they almost feel like suede. 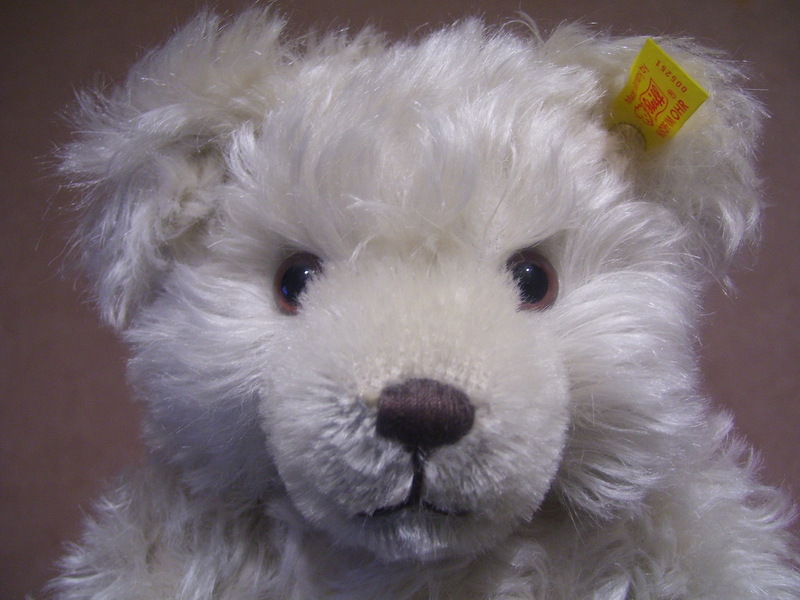 I do still believe he is English, and probably by Chiltern, one of the oldest and most respected English teddy firms. He is stuffed with kapok, with glass eyes, fur may be a mohair/synthetic blend, and fully jointed. He would date from the late 1940s-50s. Values have dropped a lot over the last few years, but he is still very collectable and would sell at a Collectors’ Fair for about $120-$150.